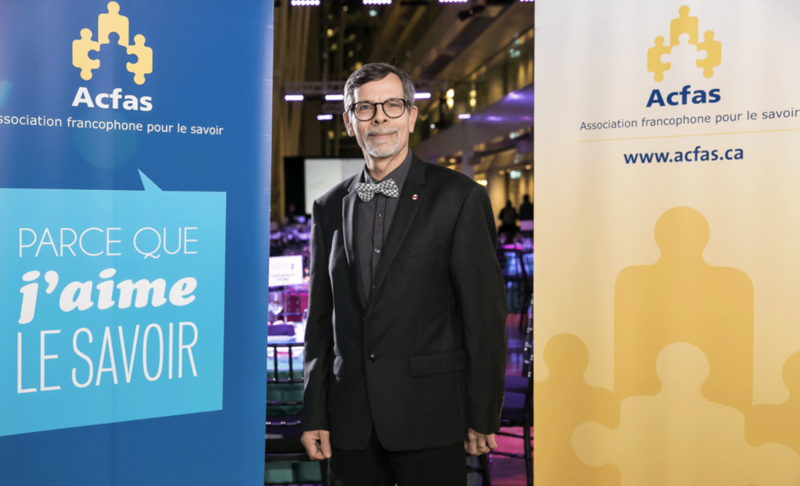 Alfonso Mucci, professor in the Department of Earth and Planetary Sciences, was among nine of Quebec’s leading academics honoured by the Association francophone pour le savoir (Acfas) for their exceptional contribution to research at the Acfas Gala held in Montreal on November 13. Prof. Mucci was presented with the Prix Acfas Michel-Jurdant in recognition of his outstanding work on the health of the St. Lawrence Estuary and the world’s oceans. Prof. Mucci made a name for himself in the early 1980s with his research on the solubility of calcium carbonate minerals in seawater, with which he established a reliable means to measure ocean acidification. To this day, his work provides a benchmark for monitoring the progressive acidification of the world’s oceans due to absorption of anthropogenic carbon dioxide emitted to the atmosphere – a process that represents a significant threat to marine life. In the early 2000s, Prof. Mucci turned his attention to the problem of deep-water acidification in the St. Lawrence Estuary and in the Arctic. He was the first to document an oxygen-depleted deep-water zone in the St. Lawrence Estuary, identifying a phenomenon that has led to the disappearance of specific species of fish, crustaceans and other forms of marine life from what was once a biologically-rich environment. “There is a catastrophe unfolding but we are not seeing it and we are not talking about it,” Prof. Mucci has said of the health of the St. Lawrence Estuary and the world’s oceans. In subsequent research, he confirmed a link between oxygen depletion in the water column and acidification – a phenomenon that is likely to have a drastic impact on the health of marine ecosystems at the surface of the world’s oceans by the end of the century. Prof. Mucci made another significant contribution to environmental science with work he carried out prior to and following the Saguenay River flood of 1996. The Saguenay Fjord sediments contain high levels of mercury, a legacy of industrial activity between 1947 and 1976. Thanks to meticulous fieldwork carried out over a period of 10 years, Prof. Mucci’s research team discovered that the mercury is now trapped by the layer of sediment deposited by the flood. The findings provided valuable insight into how mercury – a notorious marine contaminant – could be permanently sequestered. Prof. Mucci has participated in numerous national and international research initiatives, including the Joint Global Ocean Flux Study (JGOFS). Along with his students, he has taken part in ArcticNet voyages aboard the research icebreaker CCGS Amundsen since 2003, studying the effect of melting ice on carbon dioxide exchange at the air-sea interface and the acidification of Arctic waters.